So I made these burgers on Monday. And they are really all I’ve thought about ever since. Like… ALL I’ve thought about. I don’t even know if my burger obsession can be called an obsession anymore because it’s been about three or four months at this point. I think now it’s just a full blown sickness? The worst part is that I’m a little bit of a burger snob and I really don’t think anyone can make them as good as some of my favorite restaurants can. And uh, by favorite restaurants I really just mean Five Guys. $5 burger? Yes please. And a few others of course. But it seems that whether homemade burgers are grilled or pan-fried or whatever, they sort of turn into fat hockey pucks or something. It takes skill and patience. Which I don’t have. Something I have learned however is that I don’t need to stuff a ton of things into the actual burger (like garlic and minced onion and blah blah blah) and prefer just some salt and pepper. I added a little olive oil here too since I was using very lean ground beef. Which is boring but ummmm it’s April which means it’s almost summer which means that it’s time to come out of hibernation. Dinners this week have been delicious. Although I already ignored my weekly menu plan for three out of four days, meals included these burgers and last night, a mix of frozen roasted vegetable ravioli and pumpkin ravioli with brown butter, garlic and parmesan. It took approximately six minutes and was wonderful. So wonderful in fact that I tossed all the pasta in a giant bowl, turned my back to stick the cheese in the fridge only to turn around and see… the entire bowl gone. My husband had actually picked up the whole bowl because he thought I made the massive bowl of ravioli for him. Only him. Two packages. Six servings. Picked up the darn bowl, grabbed a fork and walked to the table. I thought he was joking? He wasn’t. He thought all of the pasta was for him. In his defense, he comes home late and a lot of times I eat dinner before him because uh, I am not cooking anything for anyone at 9PM unless it includes the broiler, a marshmallow, starts with an “s” and ends in “more.” For myself. Don’t worry. I claimed my portion. What we need to talk about today are these burgers. Holy smokes. I definitely stole the idea after eating a similar one a few weeks ago from a local food truck and it is by far my new favorite flavor combination. Double the cheese, perfect mushrooms, the mustard aioli I’ve been LOSING MY MIND OVER and arugula on top which makes it super fresh. I even wrapped leftovers in foil, stuck them in the fridge, then reheated them at 300 degrees for a few minutes before eating. Yeah. Still incredible. Add ground beef to a large bowl and season with salt and pepper. Add in 1 tablespoon of olive oil and mix it into the beef, then let sit at room temperature for about 30 minutes. While the beef is resting, add mushrooms to a large skillet over low heat. Add 1 tablespoon each of olive oil and butter, then add in mushrooms and stir to coat. Cover and cook for 10-15 minutes until softened and juicy. Once soft, add a sprinkle of salt and pepper, turn off heat and keep covered. While mushrooms are cooking, whisk together dijon mustard, egg yolk and lemon juice in a large bowl until combined. Slowly stream in olive oil while continuously whisking until the mixture emulsifies and comes together completely. Whisk in whole grain mustard and horseradish, then taste and season with a little salt and pepper as desired. Set aside. Toss the fresh arugula with the lemon juice and 1/2 tablespoon of olive oil. Sprinkle with a little salt and pepper. Heat a large skillet over medium-high heat and add 1 tablespoon of butter. Form the beef into 4 equal patties, then add to the skillet and cook until they reach their desired doneness. For medium-well, I cook mine about 5 minutes per side, but it will depend on how thick you like your burgers. In the last 1-2 minutes of cooking, top each burger with a few slices of both cheeses. 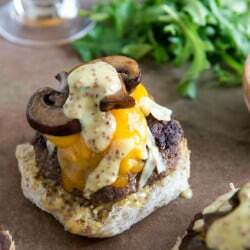 To assemble burgers, spread a bit of mustard aioli on the bottom of each bun. Top with the burger, then some mushrooms, some aioli and a handful of arugula. But this is definitely the way I would like to go. Pingback: 17 Easy Dinners Everyone Should Have In Their Arsenal | The Food Lovers! !